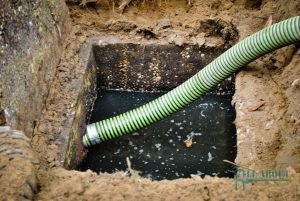 Call All About Plumbing & Septic for Septic Tank Service! 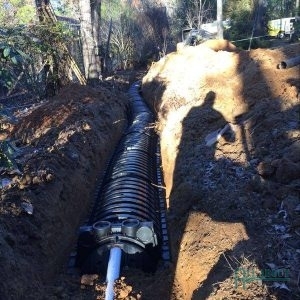 If you live in an area that is not connected to the city’s main sewer line, then your home or business uses a septic system. A septic system is in charge of separating solids from wastewater so that you don’t have to worry about solid waste or water harming you or your property. 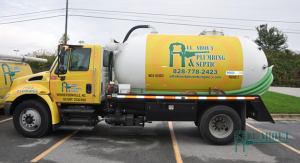 At All About Plumbing & Septic, we are experts in septic tank service in Mills River, Hendersonville, and Asheville, NC, so if you are needing septic service for your residential or commercial property, we are the professionals that you can rely on. 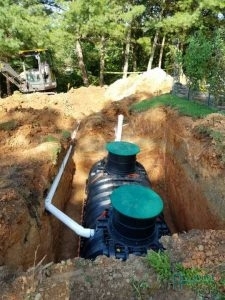 We offer a wide range of services including, septic tank installation, repair, and maintenance. Whether your aerator septic system needs repairs or you want a chamber septic system installed, we are more than happy to help you. In order to keep your septic system in the best shape possible, you should have your septic system inspected every three years, but depending on what kind of components are used to operate the septic tank, you might need inspections every year. By getting septic system inspections, our plumbers are able to tell if your septic tank needs to be pumped, cleaned, or needs repairs. If you have recently moved to a house that needs a septic tank, our plumbing contractors can install a brand-new one for you. Please give us a call today at 828-778-2423 in order to schedule an appointment time that is convenient for you. We can also give you more information on the enzyme cleaner, BioOne, that we recommend all of our clients use. If You Need a Septic Tank Installed, Contact Our Plumbers Today! To learn which one will work with your family or business’s needs, please call us at 828-778-2423 to schedule a time for septic tank service in Mills River, Hendersonville, and Asheville, NC. We Offer Effective and Comprehensive Septic Tank Repair Service. One of the best ways to keep your septic tank in the best condition is to get regular maintenance. While its an important septic tank service, it can be easily neglected. This is because our septic systems are located underground, so when something is out of sight, they are typically out of our mind. Because a septic tank is full of sludge from when the solids were removed from the wastewater, it is so important to get proper maintenance. When maintenance is neglected, it can cause issues with your septic tank. Some of the issues that septic tanks can develop are roots growing in the septic tank, the tank splits in two, the wall starts to corrode, and the tank can become too full. Even when these problems are happening, it can be hard to determine if the septic tank needs repairs since it isn’t visible. However, if you notice these things, its times to get repairs. There is pooling water around the tank and drain field. Sometimes you might only need your septic tank pumped or cleaned, but it’s worth it to call a plumber in order to make sure your septic tank isn’t damaged. If the septic tank is too damaged, then we will need to replace it with a new septic tank. One way that our clients can make sure that their tanks aren’t too full is by using BioOne. BioOne is an EPA approved cleaner that is made if all natural enzymes. Enzymes are needed in the septic tank in order to break down waste. Without the proper level of enzymes, the septic tank can’t break down waste and will become too full. BioOne is a great way to ensure that your septic system is in great shape by providing it with the enzymes that it needs. These enzymes will remove any organic waste so that the septic system isn’t too full. To learn more about this product or to get septic tank service in Mills River, Hendersonville, and Asheville, NC, call us today at 828-778-2423. We offer the best repairs for a septic aerator, pressure distribution septic system, and other septic tanks. Need Septic Pumping for Your Home or Business’s Septic Tank? We Can Help! There are unpleasant smells coming from the drain field, septic, tank, drains, or toilets. A pool of water is by the tank and the drain field. Your yard by the septic tank and drain field are very lush and green. To get septic pumping for your home or business, please call us at 828-778-2423 for septic tank service in Mills River, Hendersonville, and Asheville, NC. We are ready to remove sludge and liquid so your tank doesn’t overflow. If It’s Been Three or Five Years Since You’ve Had Your Septic System Pumped, You Will Need To Get Septic Cleaning. Another septic system service that you will eventually need for your septic tank is cleaning. A lot of time septic pumping and cleaning are thought of as the same service, but they are actually completely different services. With septic pumping, you only remove liquids and sludge, whereas septic cleaning is when all of the water and sludge is removed from the bottom of the septic tank. Each of them uses a vacuum truck to remove waste, but when it comes to septic cleaning, it is going to remove a lot more than if you get pumping for your septic system. If you aren’t getting frequent septic pumping, then you will need to get cleaning services for your septic tank. The septic tank needs to be pumped every three or five years to remove the sludge, but if it goes past three or five years, the sludge at the bottom of the tank can become compacted and thick, requiring the need for professional septic cleaning. The following are signs that you need to get septic tank cleaning right away. Without proper cleaning, you are looking at potential sewage backups and damage to your lawn, as well as issues with your water supply. Don’t wait, call us at 828-778-2423 to get septic cleaning. You can depend on our team to provide you with the best septic tank service in Mills River, Hendersonville, and Asheville, NC. Updated on January 22, 2019 at 12:18 pm by All About Plumbing.